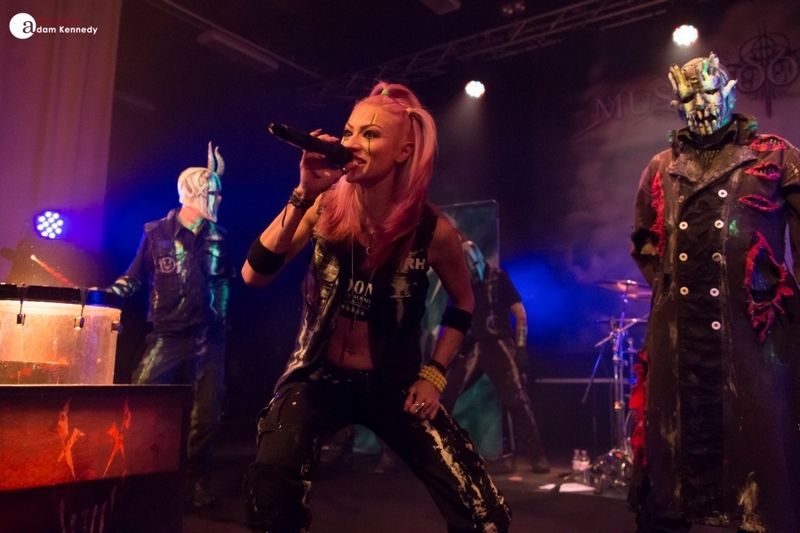 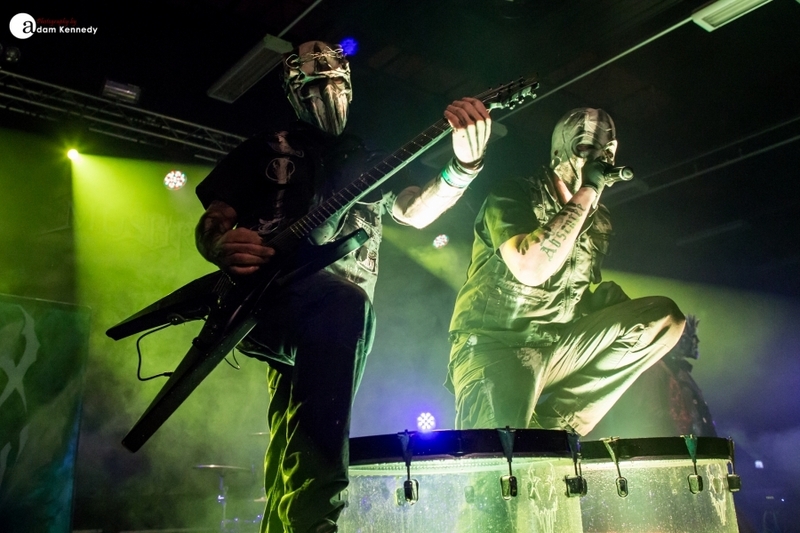 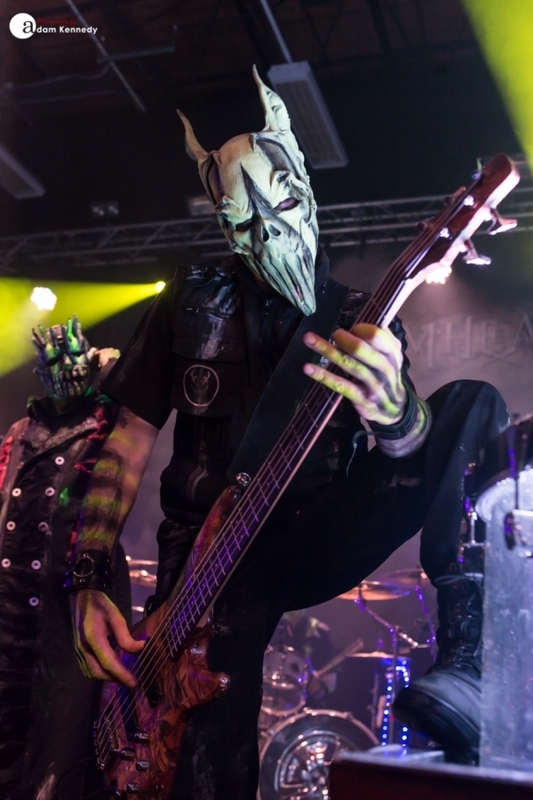 It’s been over a decade since Mushroomhead last crossed the Atlantic to play on our UK shores. 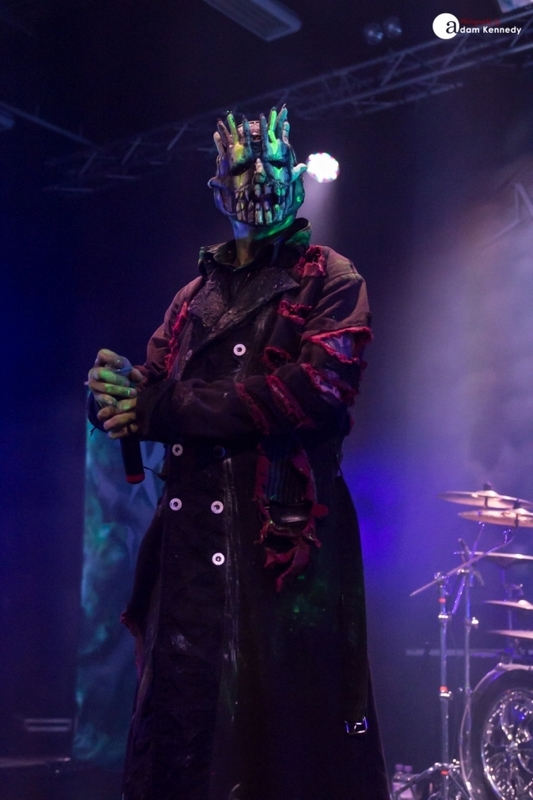 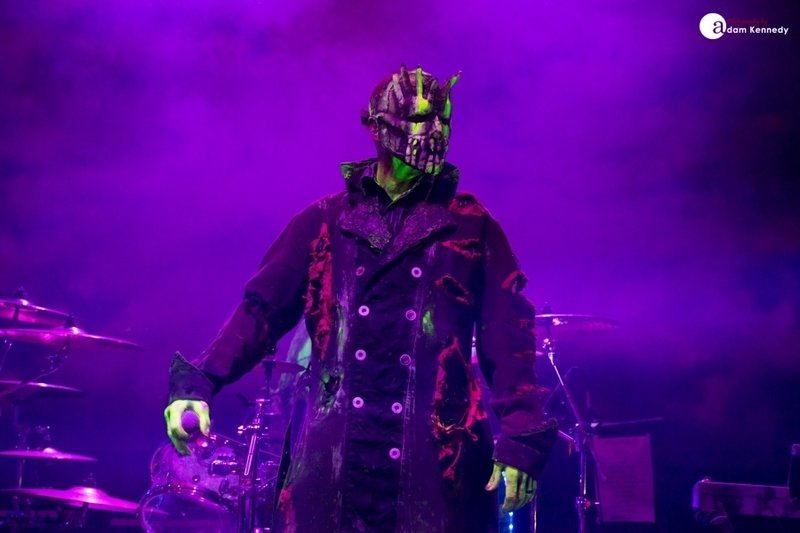  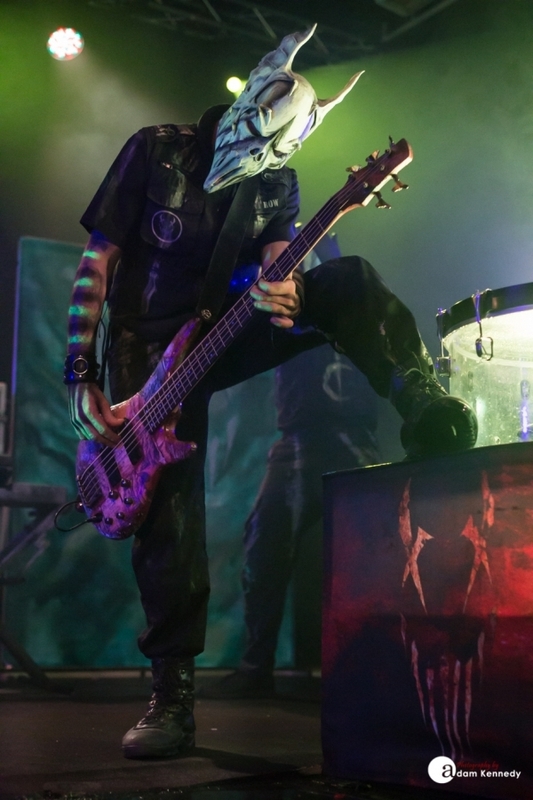 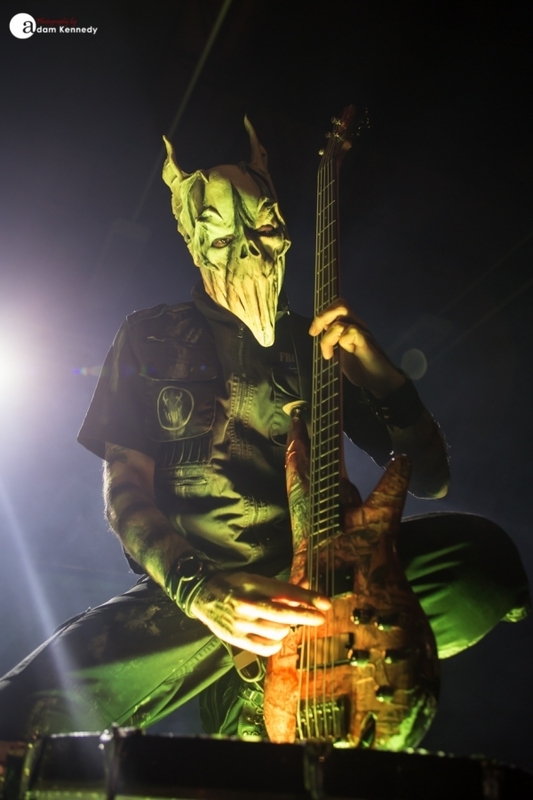 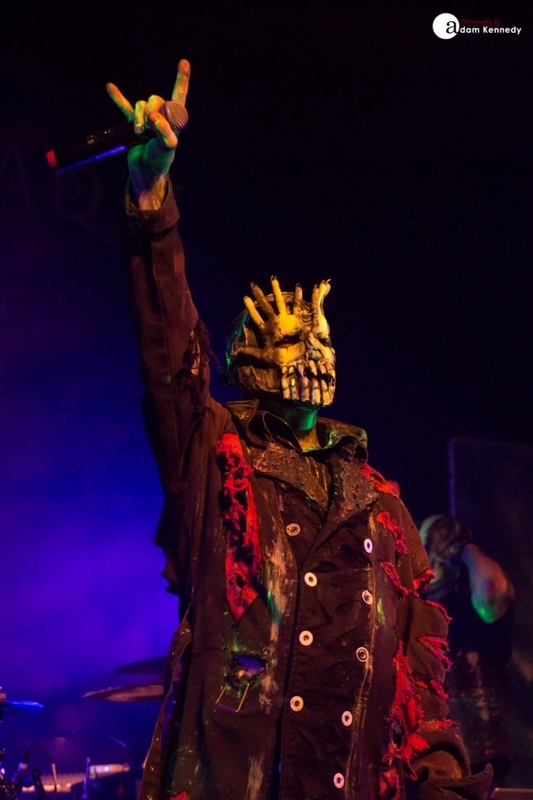 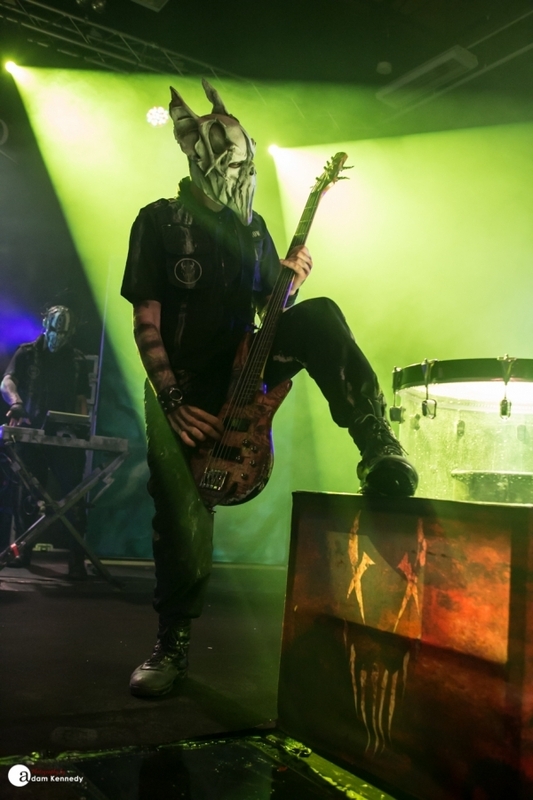 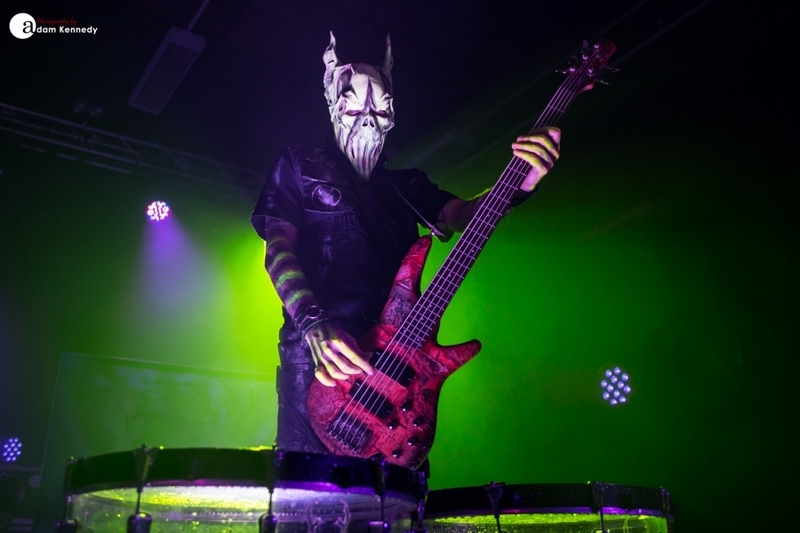 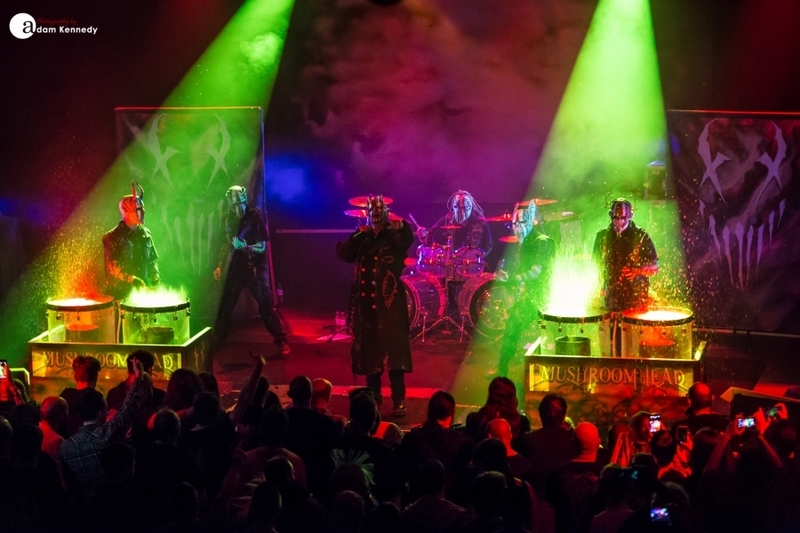 Mushroomhead is currently touring in support of their 8th studio album The Righteous and the Butterfly.Â The band bring with them in tow their unique brand of industrial metal and spectacular stage show, but more about that later. 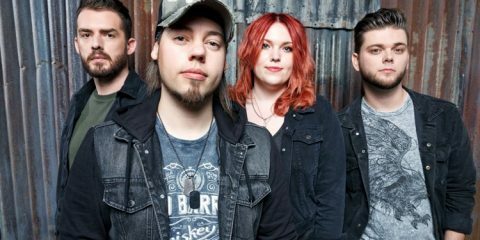 Arcite, who open the show are the only local band on the bill tonight and they have brought their fans out in force with them. 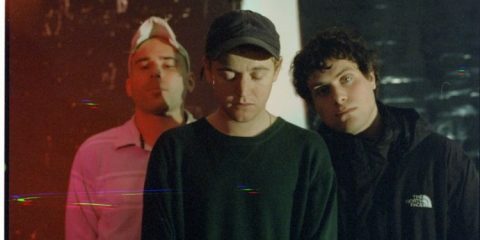 The Newcastle-based five piece have a new album coming out in the not too distant future, and give us a taste of what is to come with some of their new material. 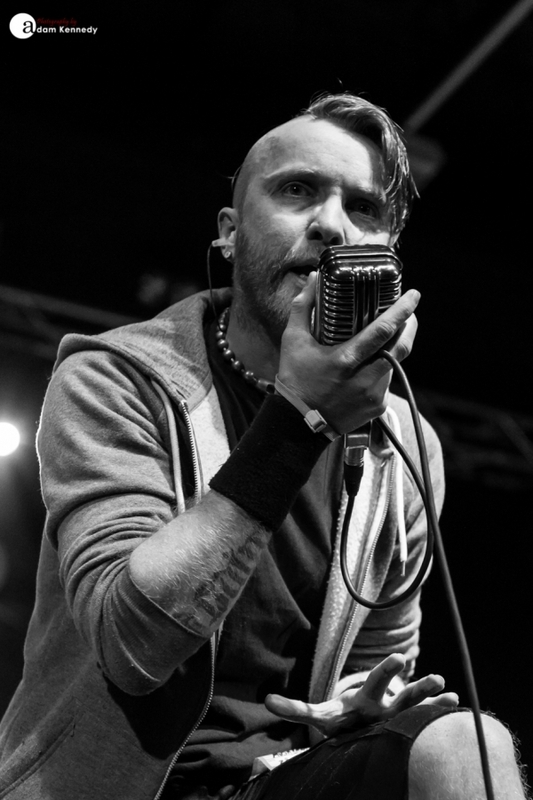 Lead vocalist Kev McDonaldÂ clutches his retro style microphone and switches effortlessly between primordial growls and more melodic vocals. 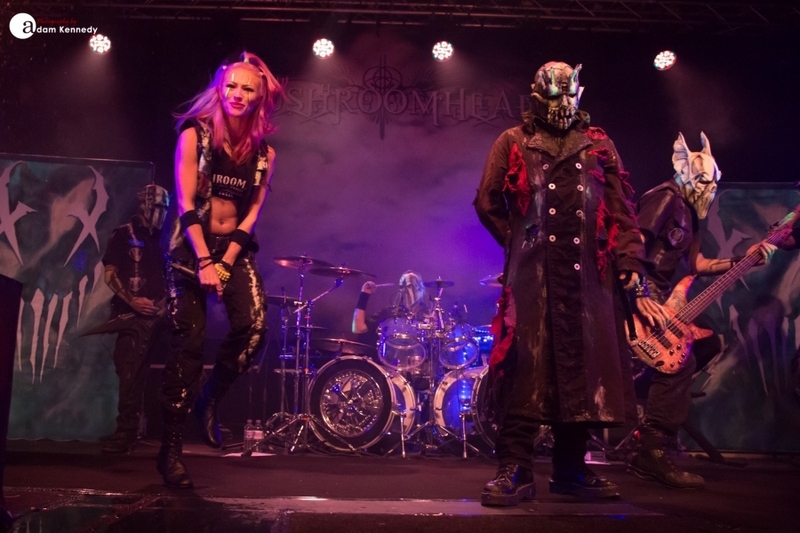 The band’s sound is reminiscent of a “Cowboys From Hell” era Pantera with crunchy guitar riffs, rolling drum grooves and pounding bass lines. 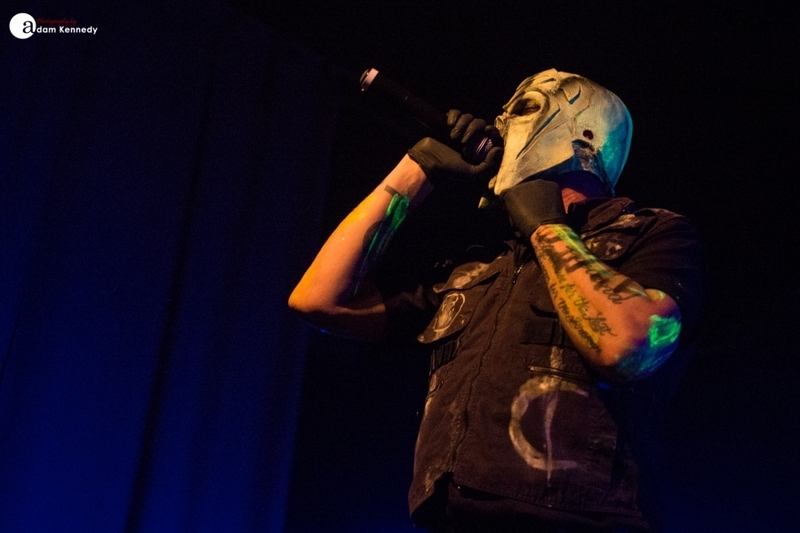 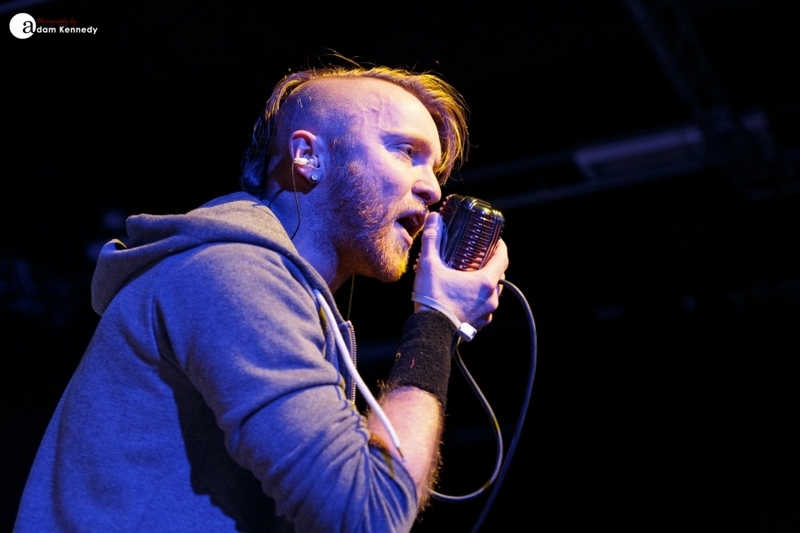 Tracks like “Amongst Ashes” and the title track of their first album “Escape The Key” have the crowd clapping along. 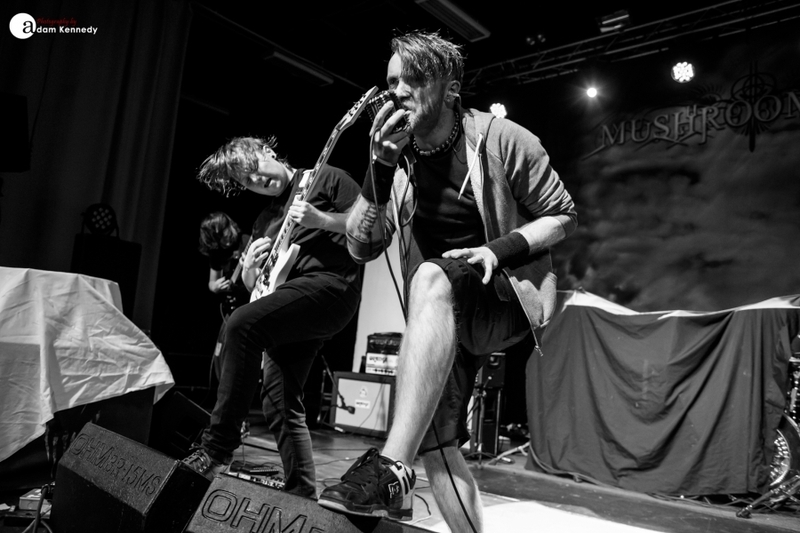 It’s great to see such promising new music coming out of the region, a band to watch out for indeed. 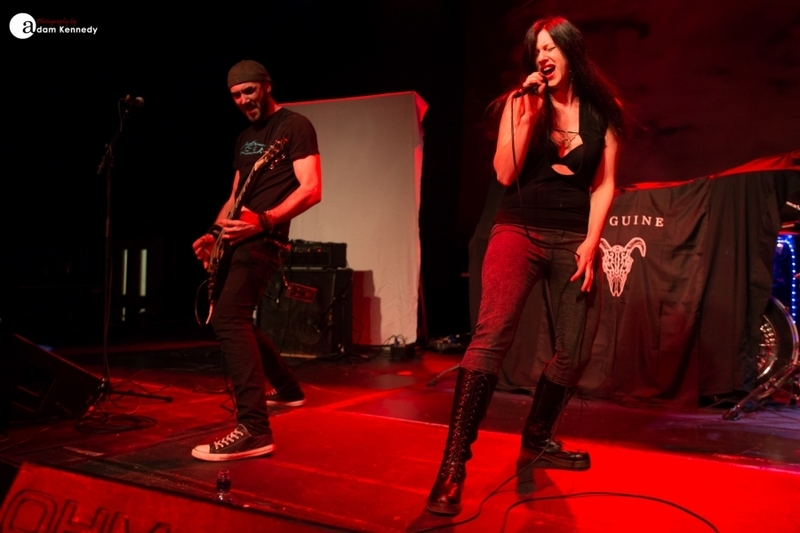 British four-piece outfitÂ SanguineÂ released their second album Black SheepÂ at the start of the year. 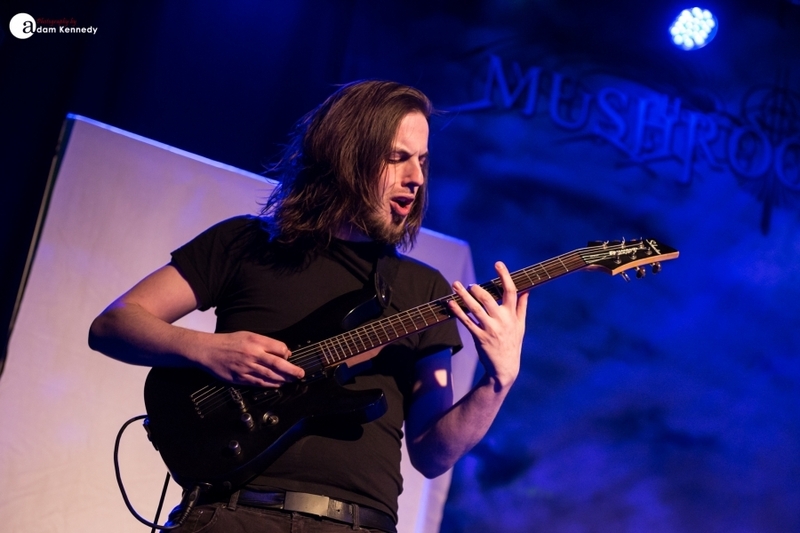 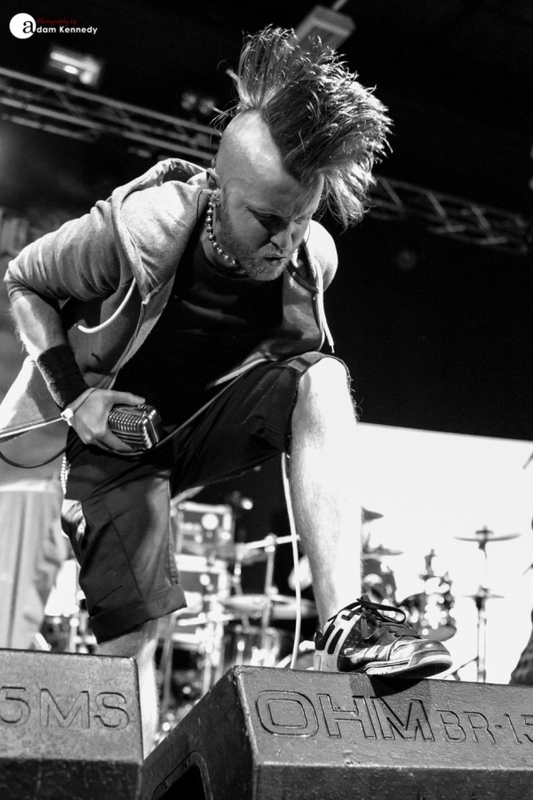 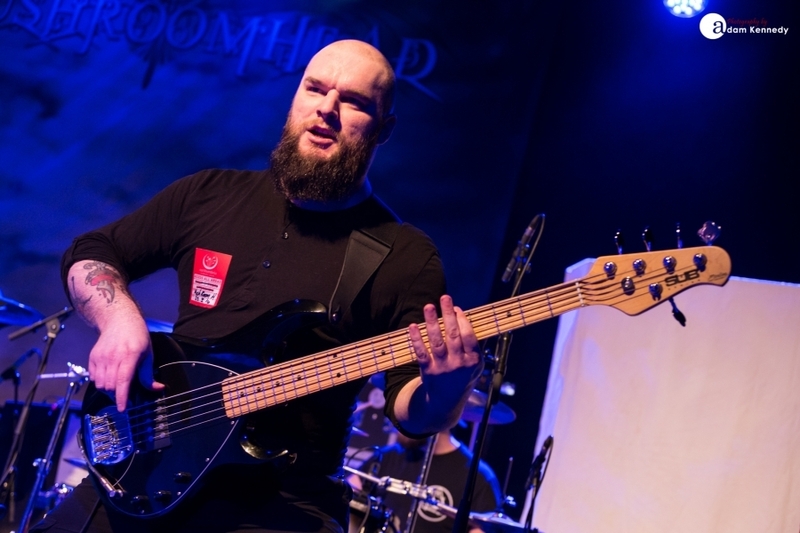 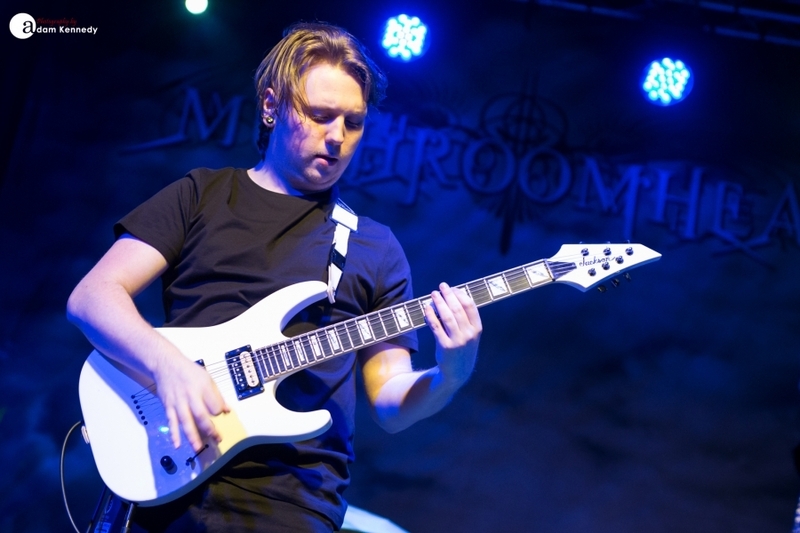 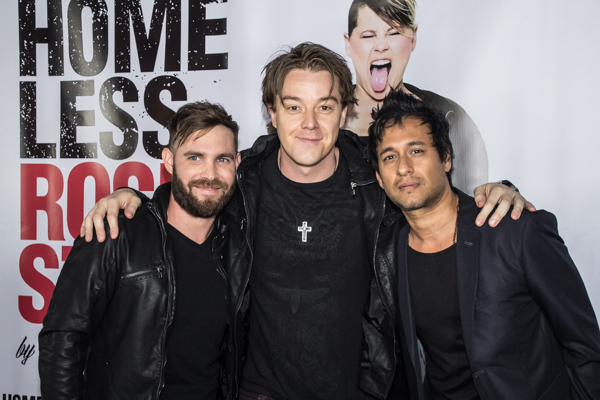 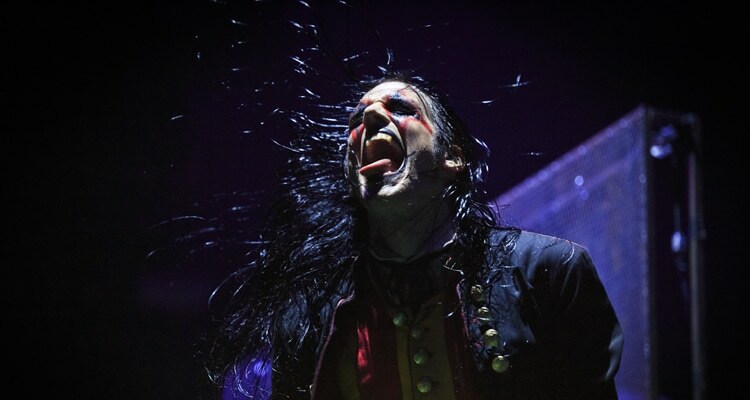 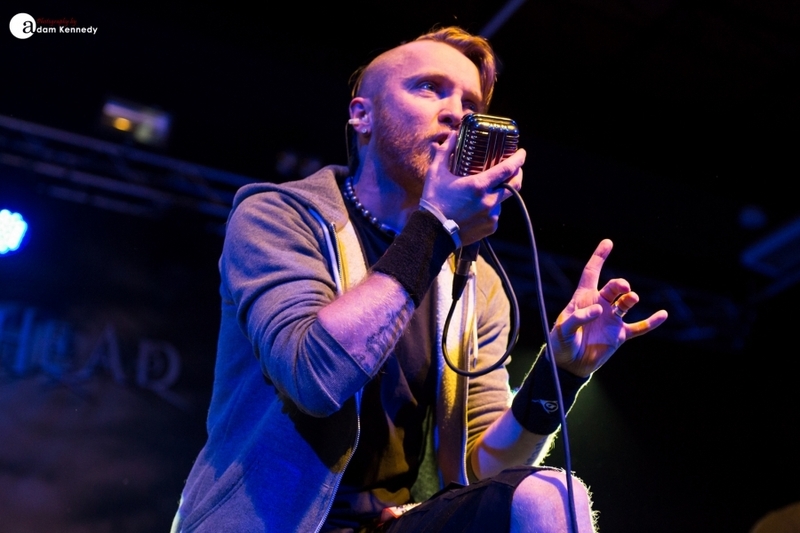 The band have been making waves in recent times having caught the attention of the likes of Slipknot’s Joey Jordison, Jesper Stromblad of InFlames and Iron Maiden’s Adrian Smith who recruited lead vocalist Tarin Kerrey for his Primal Rock Rebellion project. 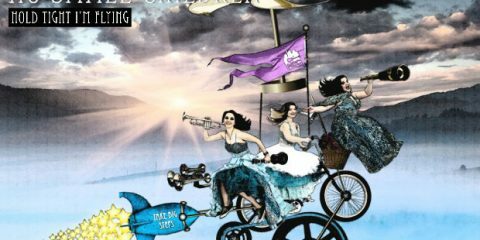 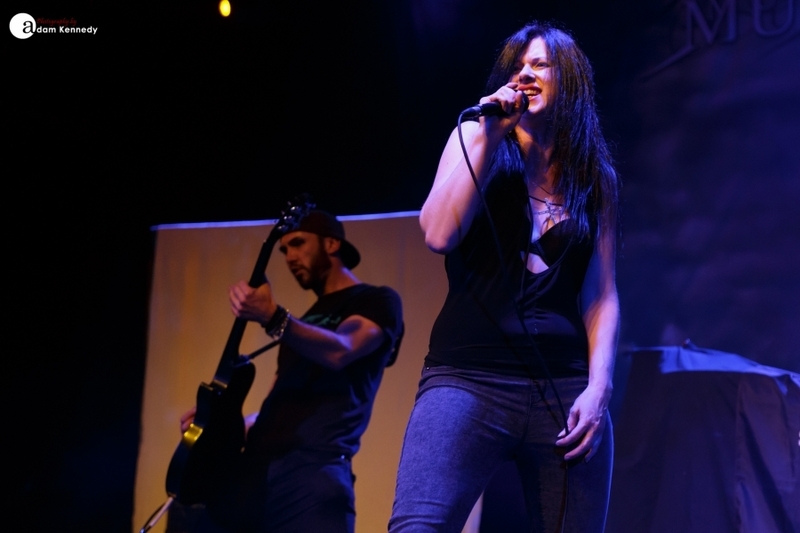 The band deliver a great set which is anchored around their latest offering, with new tracks like “Save Me”, “Breaking Out” and “Social Decay” all featuring. 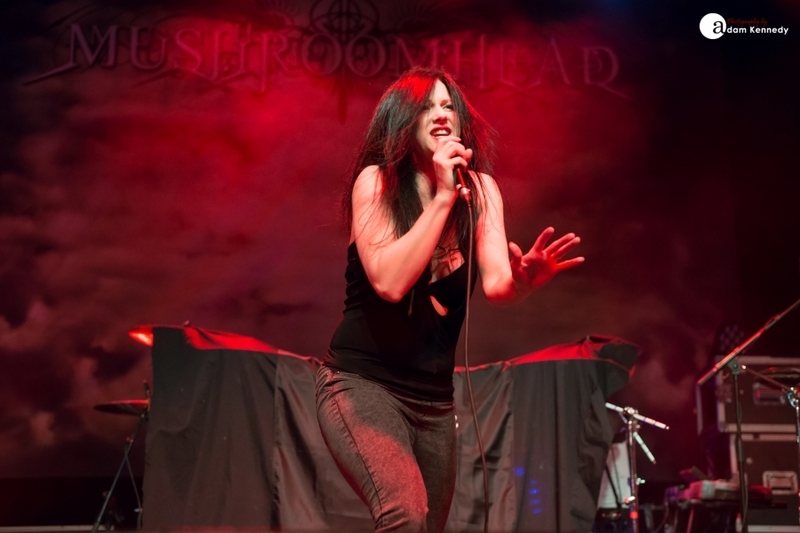 Lead vocalist Tarin commands the stage, she is fierce and has such a great vocal range. 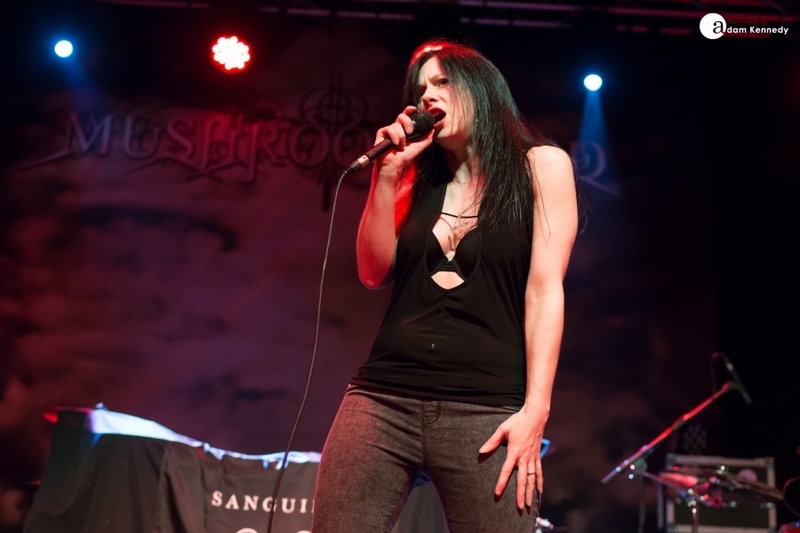 At times, her vocals remind us of that of Sharon den Adel of Within Temptation. 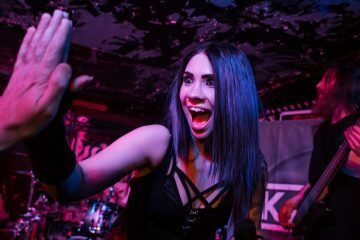 Tarin’s singing is complemented by the vocals of lead guitarist Nick Magee, the pair bouncing off each other throughout, they gel really well together. 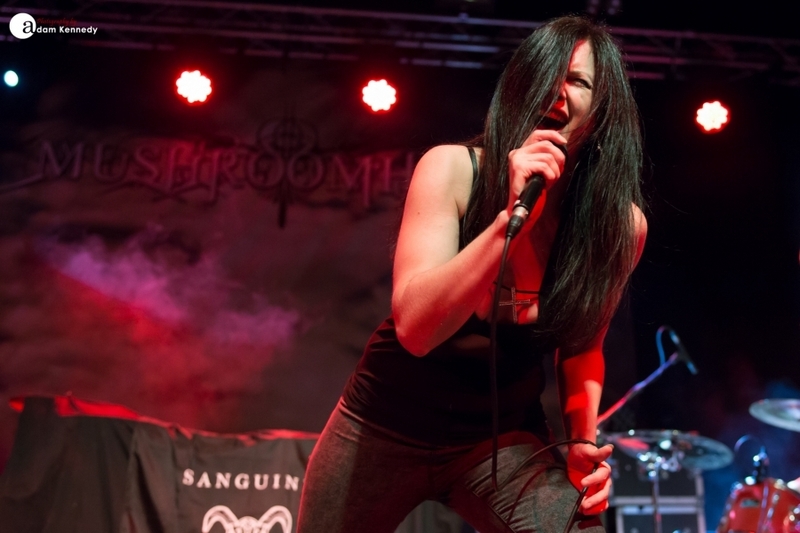 Sanguine also make room for the likes of the sultry “Bangkok Nights” from their debut self-titled album and “Raised by Wolves” which features some additional howling from the audience. 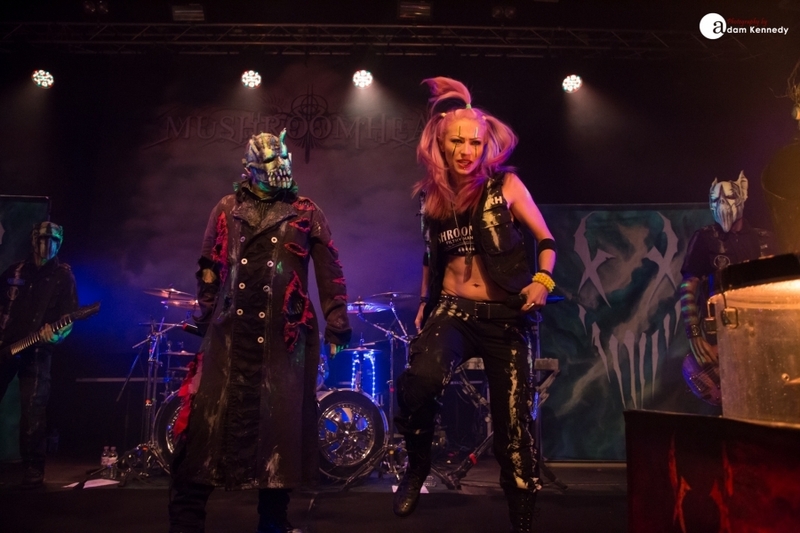 Sanguine give a high energy set which leaves the audience raring to go for the mighty Mushroomhead. 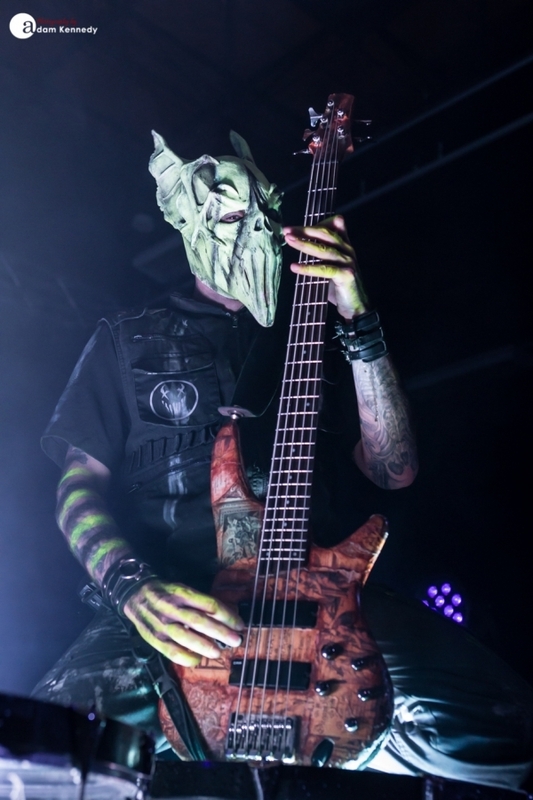 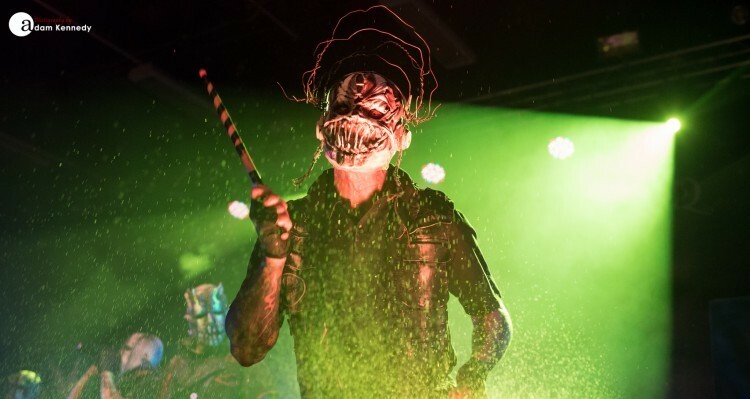 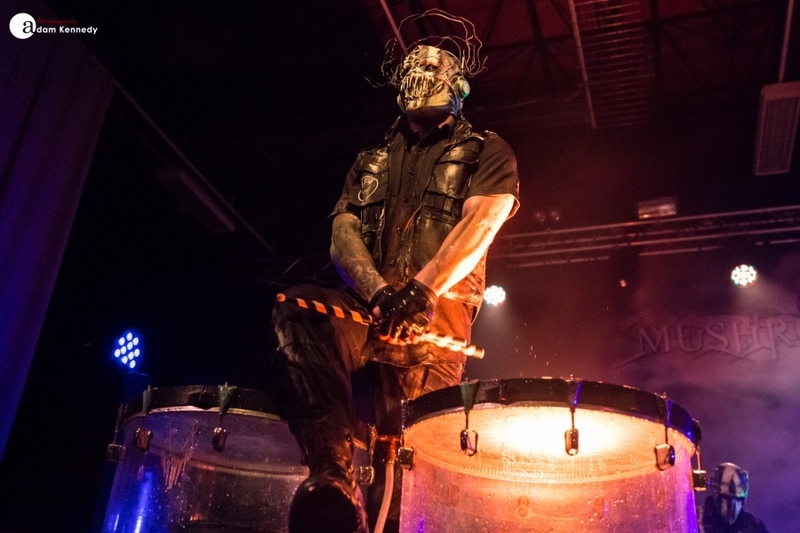 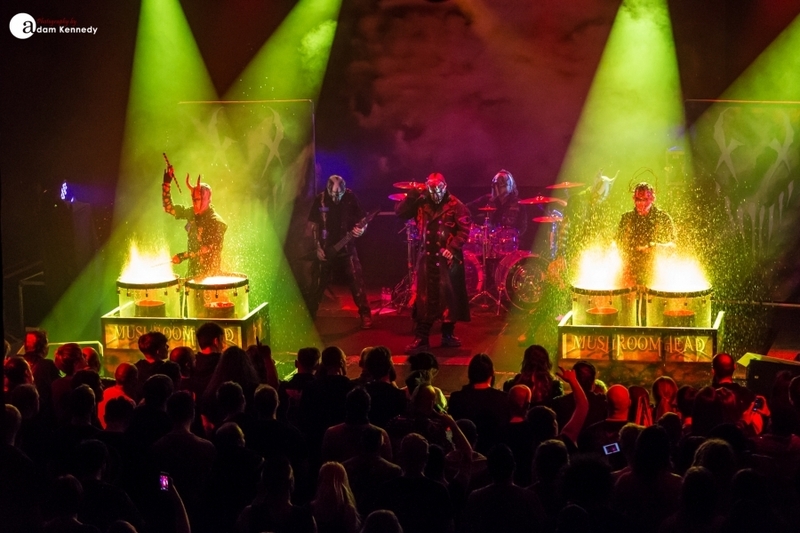 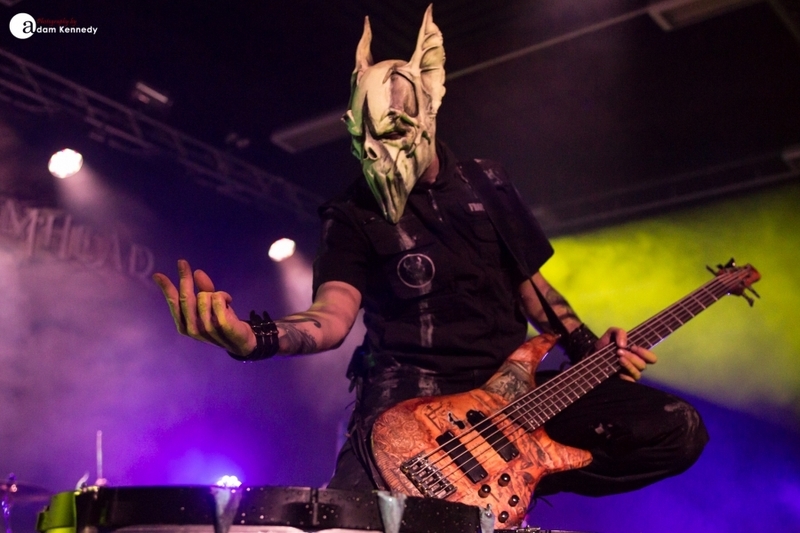 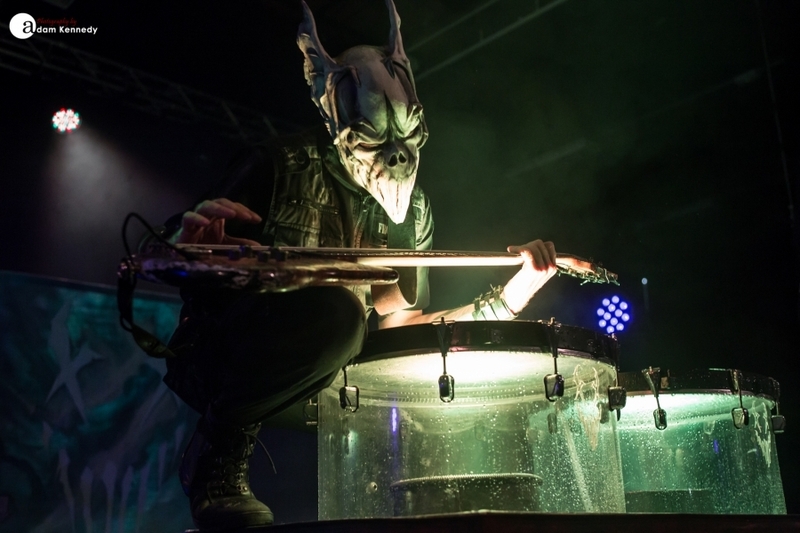 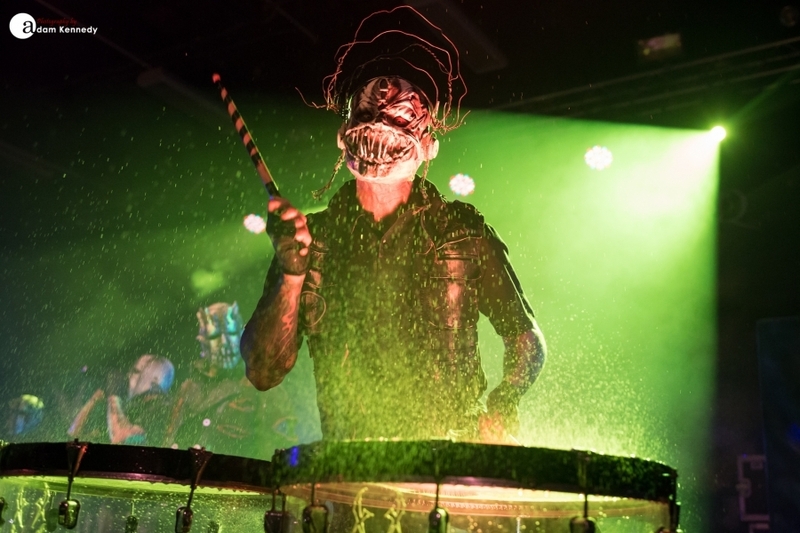 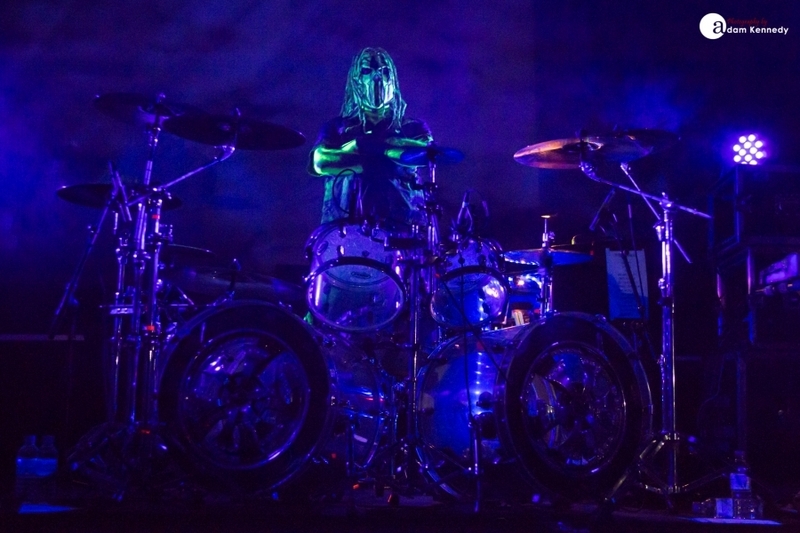 With a career spanning over twenty years, Mushroomhead has witnessed many lineup changes, but the current incarnation of the band are an unstoppable force to be reckoned with. 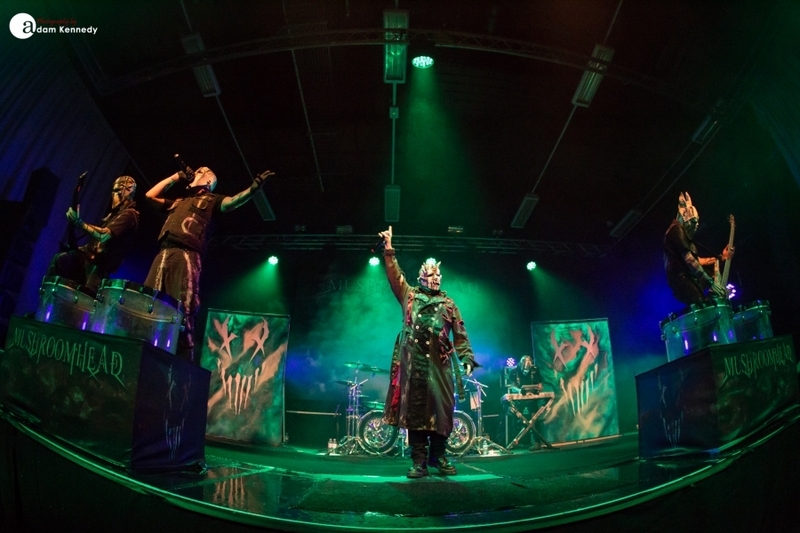 Their show really has to be seen to be believed. 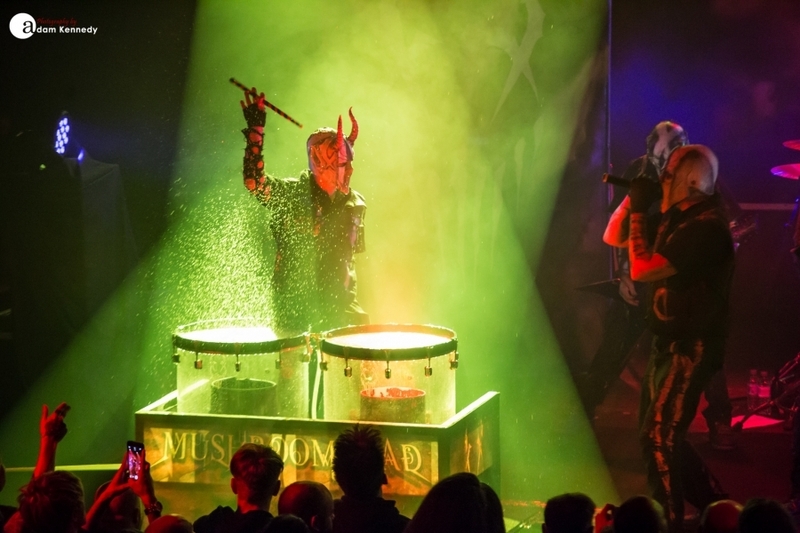 It’s both visually stimulating and theatrical, it awakens your senses but most importantly it rocks. 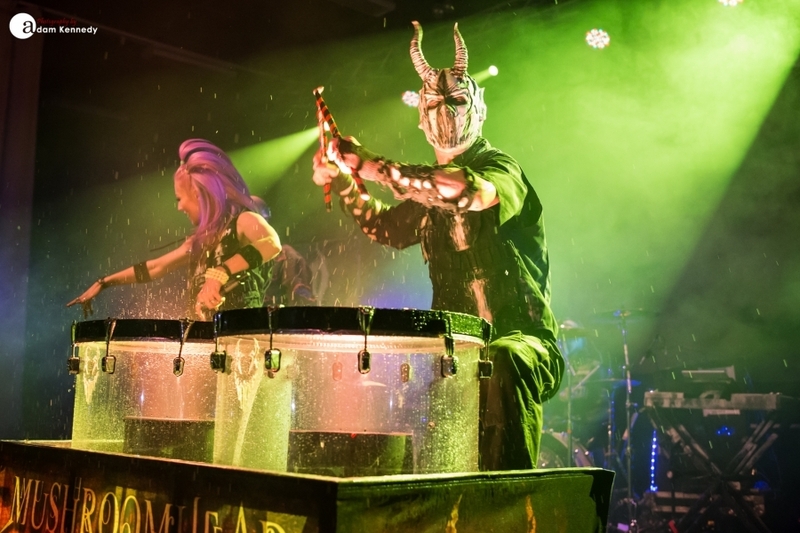 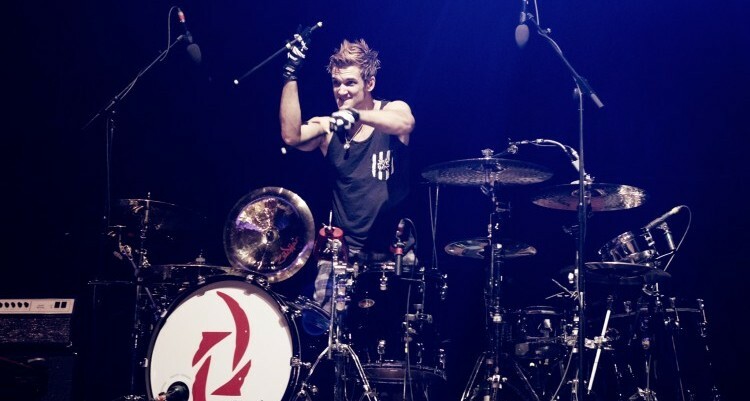 For those intending on standing in the splash zone at the front of the stage, don’t forget to bring your waterproofs, as dueling percussionists Rick “Stitch” Thomas and Roberto Diablo thrash about with their aquatic drum show. 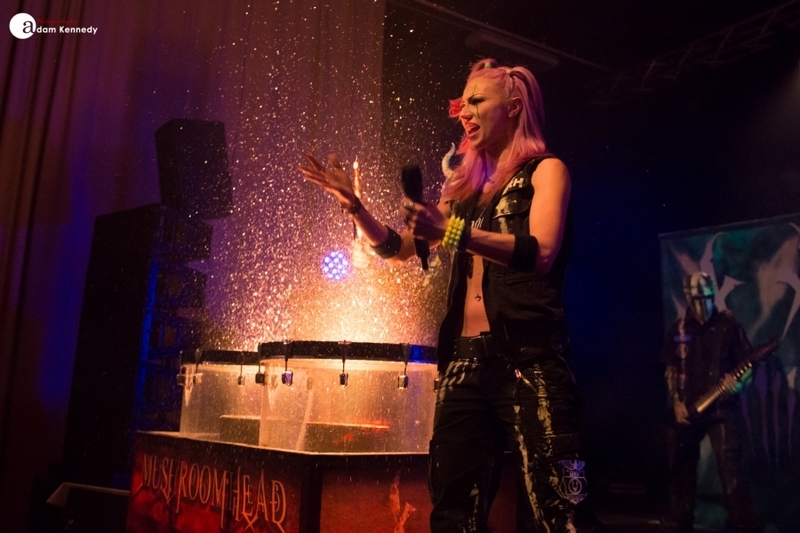 We’ve notÂ seen this much water flying about since our last visit to Sea World. 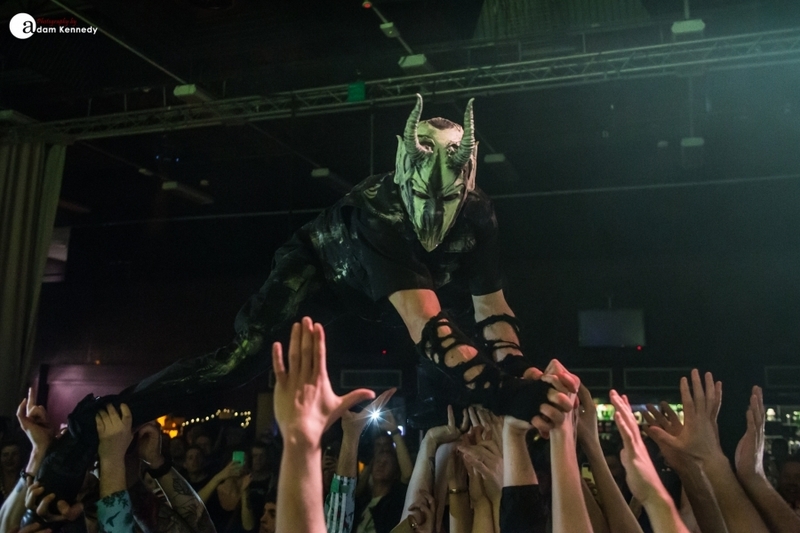 Diablo also takes the opportunity to get up close and personal with the fans with a bit of crowd surfing. 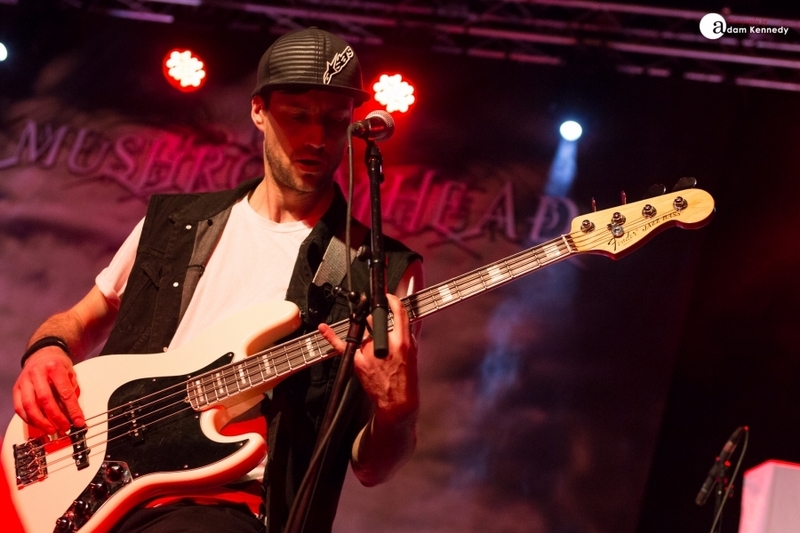 The band delivers a career-spanning set featuring the likes of fan favorites like “Sun Doesn’t Rise” alongside tracks from their latest album like “Among The Crows” and even a rather surprising cover of Prince’s “When Doves Cry,” which they make their own and it really works. 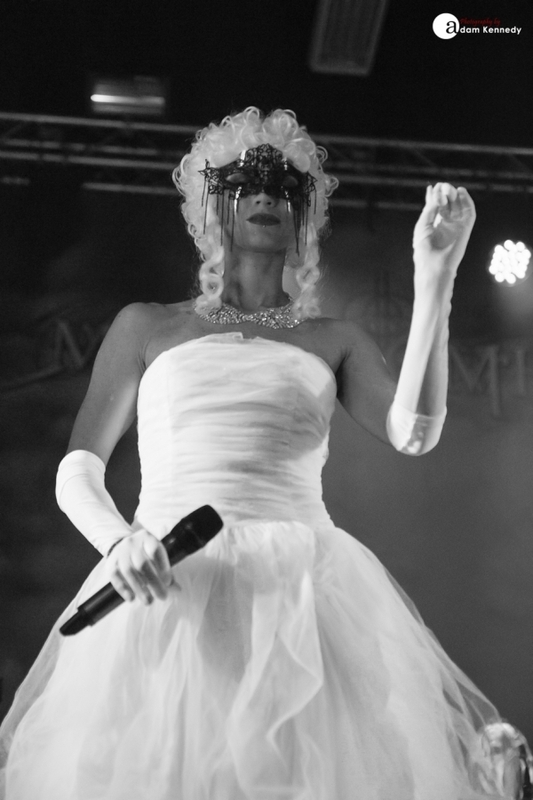 Guest vocalist Jackie LaPonza from UnSaid Fate, who features on the latest Mushroomhead offering joins the band for a few tracks including “We Are The Truth” and the beautifully haunting ballad “One More Day.” During the latter, LaPonza graced the stage in an elegant white wedding dress and masquerade ball mask. 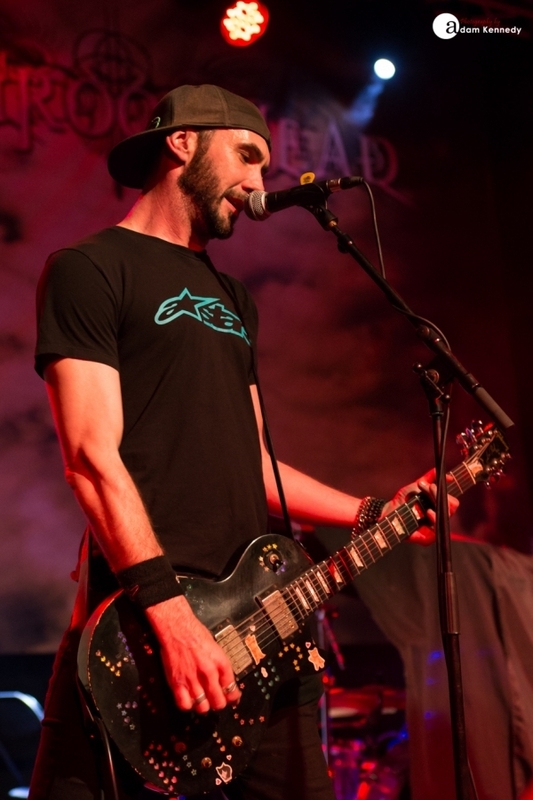 Jackie looks and sounds the part. 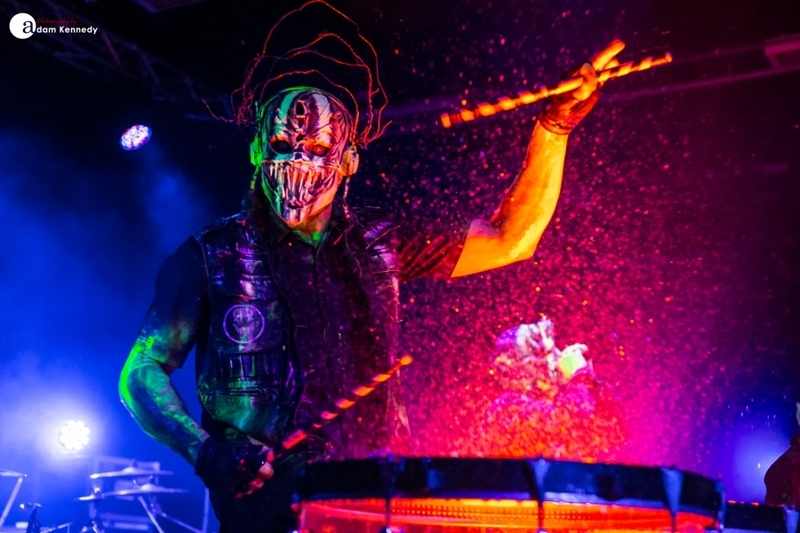 Mushroomhead most certainly delivers a show which the Geordie metal fraternity won’t forget anytime soon, and it’s great to see themÂ back in the UK. 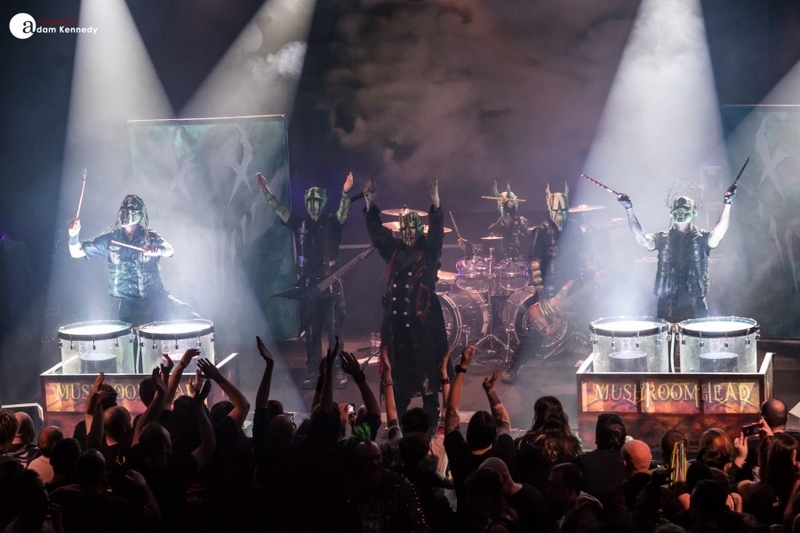 Let’s hope their next visit is sooner rather than later, but judging by the response they received tonight, it won’t be long before they return.